When kids are first learning to eat solid food, parents often make up games to get theto eat. Phrases like “here comes the choo-choo train” slowly morph over the years into “PLEASE eat something other than peanut butter and jelly sandwiches!” Pixelate is a video game that makes eating fruit into a fun, game-like experience. The set-up is pretty simple. 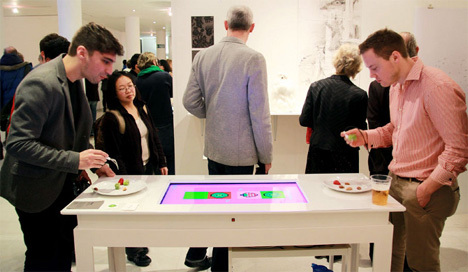 A table with an embedded screen has eating surfaces at each end. 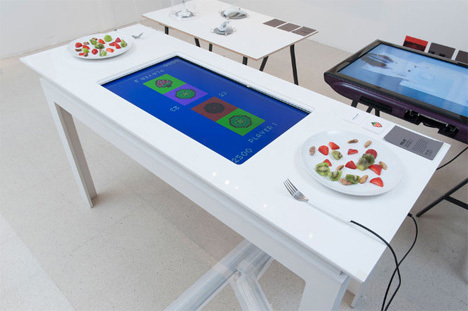 Electrified forks are attached to the table and are able to tell which type of fruit they are piercing by the unique level of current impedence that occurs when the fruit is stabbed. The screen tells players which fruit to eat and when. The player has to pierce the correct piece of fruit and eat it – and that’s all. There are no buttons to press or complex combinations to learn – it’s just you, the other player, and the question: which of you can finish your delicious feast of fruit faster? Maybe making eating into a game would be a terrible idea if it was aimed at kids, but this is more of an exploration in interaction. It also has an element of awareness-building: it forces players to be aware of what types of foods they are putting into their mouths. But ultimately, Pixelate is a fun interactive game that rewards you for eating your fruit – and maybe that’s something more of us need.